I love this Fried Rice for lunch - be sure to make extra! You can use up any leftover vegetables you have in the fridge, frozen, or chop up fresh. In a large nonstick skillet, saute onion in oil until tender. Add ginger and garlic; saute 1 minute longer or until garlic is tender. Add the teriyaki sauce, lime juice, brown sugar, salt and hot pepper sauce; bring to a boil. Reduce heat; cook and stir for 2 minutes. 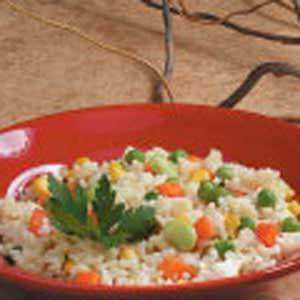 Add rice and mixed vegetables; cook and stir over medium heat until vegetables are tender. Yield: 6 servings.